Work Has Gotten More Diverse. No Duh! Have you noticed how diverse our work lives have gotten lately? Not so much at the top of organizations–we still have a long way to go there–but in terms of getting actual work done, most of us are dealing with quite a bit of diversity. Have you worked on a ‘virtual team’ with people in other countries? Does your company have global customers? Do you have to deal with other generations in your office? Is your company part of a global conglomerate? Age, gender, religion, country, neighborhood, state, region, race. All of it contributes to the work of work. We are most comfortable with people like us. Even those of us who think of ourselves as diversity-gurus are more comfortable with people like us. Back in the caveman days when we all lived in the same cave for all of our lives, that was OK. Now it is absolutely necessary that we come out of our comfort zone and learn to work together, learn together, and yes, even enjoy each other. Even when we don’t venture outside of our own groups, there are enough issues that cause problems. 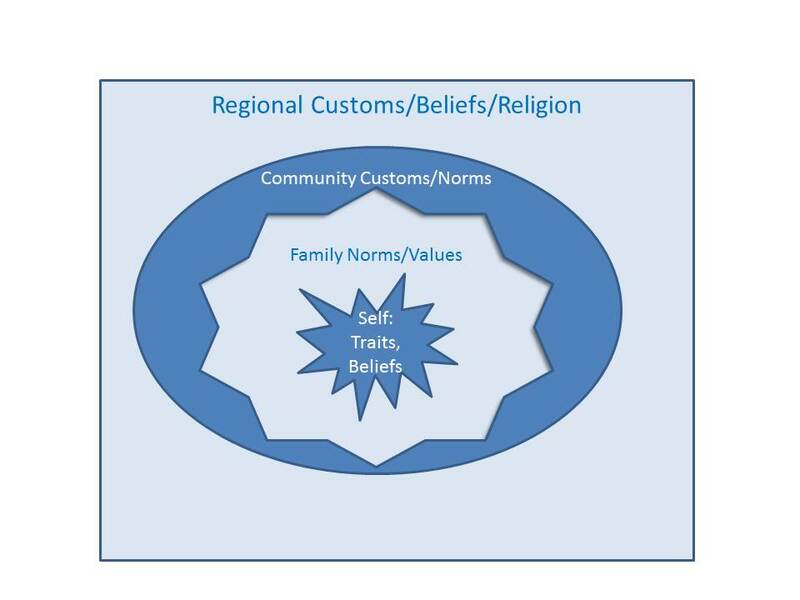 The things that we believe about ‘the way it should be’ come from our own thinking patterns, our values, our family input, the norms within our community, and the regional influences. 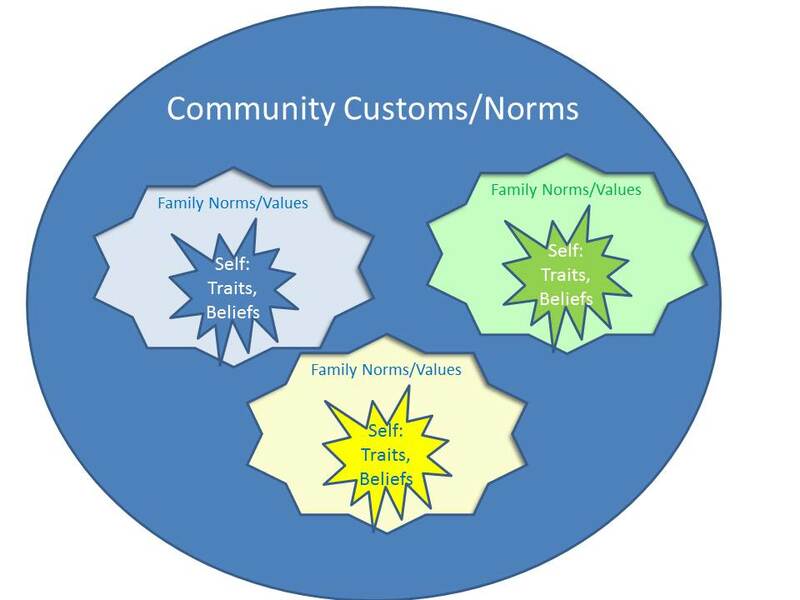 When we stay within our own community, we have conflict among each other (think your extended family Thanksgiving or the last family wedding your attended). We disagree about what is right and how to decide that. We disagree about what is important, how to raise children, politics, food, neatness. You name it, we can disagree about it. When you throw those complexities into the workplace, we’re all out of our comfort zone. That’s not going to change. So, we need to work to get to know each other. We need to really learn to understand these differences and appreciate them. We need to come out of the “I’m right and you’re wrong” automatic response that our brains do without our even thinking about it and adopt a more reasoned approach to appreciating the complexity of human interaction. 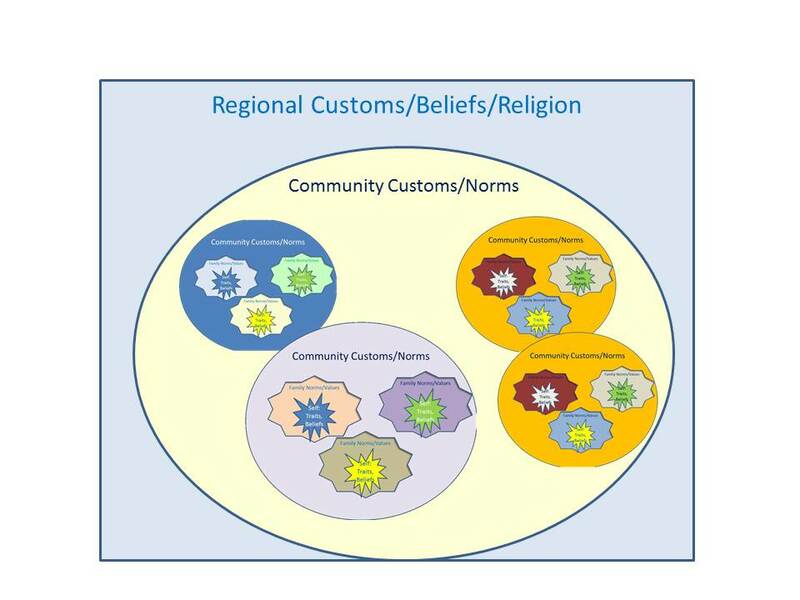 One of the best books to help understand the differences across cultures (and oh, by the way, why you think the way you do) is Riding the Waves of Culture by Fons Trompenaars and Charles Hampden-Turner. What If Your Leader Won’t Act? What if my leader won’t . . . I get this question all the time. My leader won’t make a decision; what do I do? Why won’t the leadership in my company LEAD? Things go up the chain, but nothing comes back down. Why won’t they DO anything? What do you do when you manager won’t . . . ? Your leader can’t/won’t make a decision. Just because someone has a ‘leader-type’ title, doesn’t mean s/he is a leader. Sometimes people are overwhelmed by the responsibility of making a decision. Sometimes people get stuck making decisions because all the alternatives seem equally bad. Or equally good. Sometimes people are waiting for someone else and it isn’t obvious to the people waiting on them. Don’t get stuck on the fact that the person outranks you and won’t do what you believe is appropriate to his/her role. The important thing is to get things to the place that the organization can move forward, not WHO decides. Your leader won’t step in and resolve a conflict. Why don’t you figure out how to do this yourself? You shouldn’t need an adult to get things resolved for you. Figure out a process for resolving the dispute and get the other person to agree to the process. Then apply it. In other words, agree that you’ll ask others, or you’ll have a vote, or you’ll agree to disagree, or you’ll take turns. Then do it. Don’t let your manager’s conflict aversion cause things to stop. Your leader won’t resolve a resource issue. Can you figure out why your manager can’t/won’t resolve it? Does s/he believe there is a resource issue? Does s/he believe that the resource issue will really negatively impact the project/organization? Does s/he believe that the answer will be no from his/her management? Approach the problem by laying out alternatives. “We can add these resources OR we can reduce the work OR we can slow things down.” Sometimes helping the person see all the alternatives helps them pick one (which may not be your first choice, but may resolve/reduce the problem). Think the problem through thoroughly. Come up with at least three potential solutions–one of which is add resources. What if there is no money for the resources you need. Then what? What would you do? HELP your manager figure this out. Your leader won’t do ANYTHING. First, make sure this is true. Are you sure that this is reality or your perception–ask others who work for your leader or who have in the past. Ask what has worked for other people. If nothing works, then you have a choice. You can either give up (I STRONGLY don’t recommend this) or you can go find another leader. 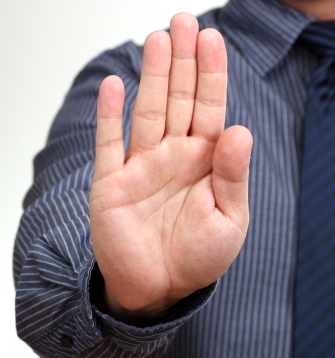 If you allow your leader’s inaction to shut you down, then it will likely derail your career if it becomes a pattern. If you decide to choose another leader, make sure that the new leader is what you’re looking for in a leader. Just as there are patterns in the relationships we choose, there are patterns in the situations we get into at work. There is no point in wasting years of your career in a no-win situation. Way back, before most of us were working, you got a job with a company and you stayed with that company–making steady progression–until you retired. You were, of course, a man. If you got fired, you had done something pretty bad. Layoffs didn’t happen very often. There were career ladders that you took all the way from your first position to your last position. This is so long ago that many people reading this don’t get it, don’t know why we still talk about it, and think this is a no-brainer. We still talk about it because this model still shapes our expectations in many ways. Our infrastructure is not set up to support the current reality–if so, we’d have portable health insurance and retirement plans. We’d also be much more focused on taking care of ourselves in our careers rather than leaving it to companies. It is time for our mental models to catch up with reality. 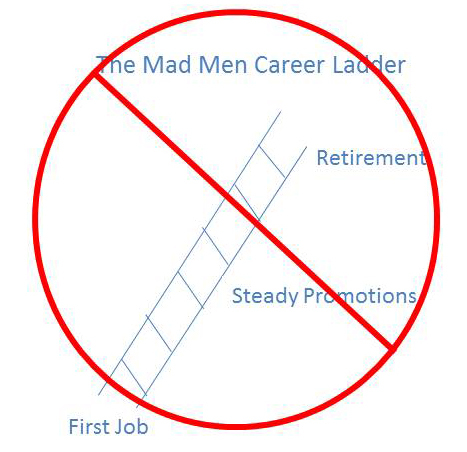 The current ‘career ladder’ looks a lot more like those cool folding ladders that can be shaped over obstructions and can bend in several directions as necessary to do the job. 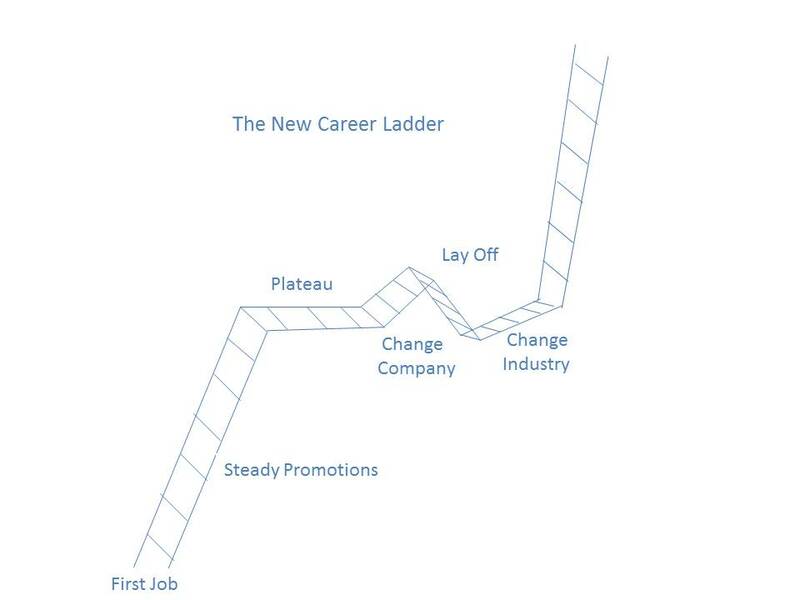 The current ‘career ladder’ takes you up when that is possible and helps you deal with the plateaus, job losses, industry and functional changes that are necessary to remain resilient and successful in today’s economy. Today’s ‘career ladder’ needs to focus on skills and trends rather than specific roles in specific companies in specific industries. Find ways to “Genericize Yourself,” that enable you to move across industries. Find ways to specialize (I know, those sound like opposite pieces of advice, but they aren’t), so that your value (brand) is obvious. Build your resilience for all kinds of shifts in the economy–think of the shifts that have happened in publishing, electronics, e-marketing, and are happening in health care and communications now. You can’t know what is coming, but you can be ready. Who would you rather work with if you’re implementing a new change in your organization? Would you rather work with someone who has been there for ten years–who knows his/her way around the organization, who knows how to make things happen in the organization? Or would you rather have someone who has been there a couple of months, who has begun to know where the bathroom is and where important people sit? Why is that? Because the ten-year person is really committed to the way things are–‘the way we do it.’ Even if s/he doesn’t like it. Even if s/he complains about it. The ten-year person has been through all the ‘we tried that and it didn’t works,’ all the times s/he had to be reorganized or was left to do the work of those who left, who had to learn new systems, and who may or may not remember the good parts (results) of those changes, but who does remember the problems. The ten-year person doesn’t want any more change (unless s/he gets to direct it). The new person not only doesn’t have that history, or those scars, but also EXPECTS to have to go through those kinds of changes and challenges. The new person follows directions and tries to please whoever is in charge. Are you the new person who is emotionally and intellectually ready to not only participate, but also to help? Or are you the long-term employee who isn’t? You may be telling yourself that you are change-ready. And maybe you are. But change burnout, or change immunity, happens to all of us. Yes . . . even me. I’ve been doing change management for a long time. I really know how to spot resistance and how to deal with it. I got a new boss one time, after having changed bosses 3 times in the past 12 months. I didn’t even realize how done with new bosses I was. That is, I didn’t realize it until one of my employees said to me, “For someone who knows so much about change, you sure don’t handle it very well.” She was right. I wasn’t handling it well. My capacity to deal with change had been used up and I was on the resistance end of the continuum. My employee did me a favor. I didn’t really realize how much my fed-up-ness was showing until she said that. Wouldn’t it be a good idea to put yourself in that new employee mindset? Wouldn’t it be a good idea to try to think like someone new to the organization (while at the same time bringing all your organization skill, knowledge and abilities to the table)? Whenever I become aware that I’m in ‘resisting’ mode, I remind myself–if I had just started today, I wouldn’t think about all the reasons this is a stupid idea–I would just accept it and do it. Note: I am not saying that you should blindly follow without contributing opinions and constructive criticism. Just be sure that that is what you’re doing though, and not resistance. Resistance is a normal reaction, but it isn’t helpful to your career, so learn to manage it. 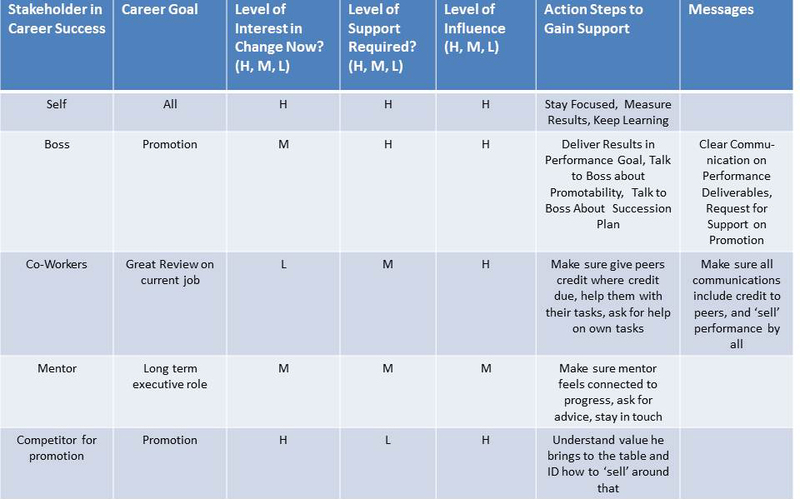 I’ve been working a lot with Stakeholder Plans for large organization change lately, and I was thinking that it would be a good idea to create one for a career plan. For those who haven’t had the pleasure of creating a stakeholder plan yet, it is a way of identifying who has a vested interest (in this case, in your career success) and creating a plan to get their help in achieving your goals. For example, identify who has any kind of an interest in your career success: your boss, your peers, your mentor, your former bosses, your family, your future boss. Anyone, whether they are supportive, neutral or hostile to what you want to accomplish, should go on the list. Then identify which career goal each has an interest in and what that level of interest is–your boss may have a high level of interest in your successful delivery of your current performance goals, but no interest at all in your promotion to a position outside his organization. Understanding this, and creating a plan to mitigate your boss’ ambivalence may be essential to getting that promotion. S/he may sabotage your promotion in order to keep you. 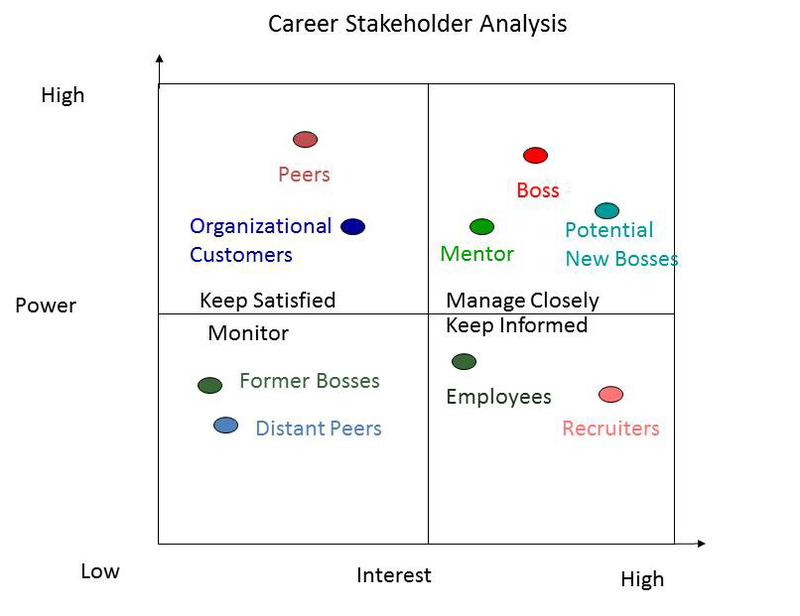 A stakeholder assessment–that requires you to think through all the players and come up with both an action plan and a communication plan for each, is likely to crystallize your thinking of next steps, and to speed your career on its way. Depending on your goals, your organizational situation and your timing, these stakeholders and their position on the grid will be different. The most important part of this is to think it out–where are your key stakeholders on the support continuum, what is in the way of their full support and what can you do about it? People feel threatened by other people’s career success and the more you’re aware of what people are thinking, the better you will be able to manage it. Stakeholders who could be powerful supporters for your career goals may not know what they are–this exercise can help you identify that issue and come up with a great plan to solve it. Congratulations! You just got promoted. Or you just got reorganized into a new department. Or you just got a new boss. How do you make this a step in the right direction and keep from crashing and burning. Ok, crashing and burning is unlikely–you did persuade someone that you deserved the promotion. Getting stuck is a possibility. Looking like you weren’t ready is a possibility. Not making a great impression is definitely a possibility. So, what do you do? One of the most important things to do is to understand that this is a NEW job. Treat it as if you just got to a new company. Look at the experience through new eyes. Who are the people? What is the power structure? What does the company need to be successful. What does the department need to accomplish in the short term? In the long term? What does the department need from you to be successful? Go talk to people as if you’re meeting them for the first time. What is important to them? What are their goals? 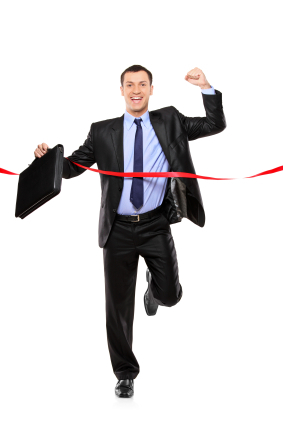 How can you hit the ground running? How can you quickly show that choosing you was the right choice? There is a subtle difference for most of us when we change jobs within the company and when we change companies. When we go to a new organization, we are completely aware that we don’t know everything. We have our hyper-alert antenna out. We are in the “conscious unconscious” state of learning. We are aware of all the things that are different from our last experience (although we frequently miss things because of our ‘old company’ mindset). When we change jobs within the same organization, we think we know how it is. We know a lot of the people (although through the eyes of the last group we were in), we know the business (ditto), we know the problems, challenges, opportunities (ditto, ditto, ditto). The problem is, the new job within the same organization is just as new as the other. If you put yourself in the same hyper-alert state, you are much more likely to be highly successful. You are much more likely to impress, because people will see you differently (than they had before) too. Remember that although people may know you (some may even have been your peers before your promotion), you still have the opportunity to make a ‘new’ first impression. If you are really trying to make a good impression, you’re likely to get attention again. Make sure it’s the right impression. Make sure you don’t come across as arrogant or smug (especially to your former peers). Make sure you come across as smart and interested and capable and willing. Make sure that people see results QUICKLY. The best way to do all of this is to treat the promotion as if it were a new job at a new company.